Kogan sent me a media loan unit of their Agora Netbook Pro for me to test & review on Twitter and my Blog before it was sold to the public. After testing it for few days I’ve given it the coveted & rarely given “Neerav’s Going To Buy It Award” because I was looking to buy a netbook laptop computer & it’s the best candidate in terms of Price Vs Performance + Specifications. With a widescreen 10.1″ LCD, 2GB of RAM, 6-cell battery, gOS (linux) operating system and light weight of only 1.4kg at a sharp price of $539+ delivery it could be the perfect halfway point between underpowered netbooks and powerful but heavy notebooks. Boot time: Using gOS out of the box Time to login screen = 55 seconds, total time to desktop 1minute 20seconds. Reputed to boot quite a bit faster if using Windows 7.
gOS Operating System – is leaps and bounds more user friendly than Linux operating systems I’ve tested in the past but people familiar with Windows may find themselves using it a bit slower and less efficiently until they learn where all the applications and settings are changed. Kogan say their support team will happily guide you through the process of installing other operating systems like Windows XP, Windows 7 etc. 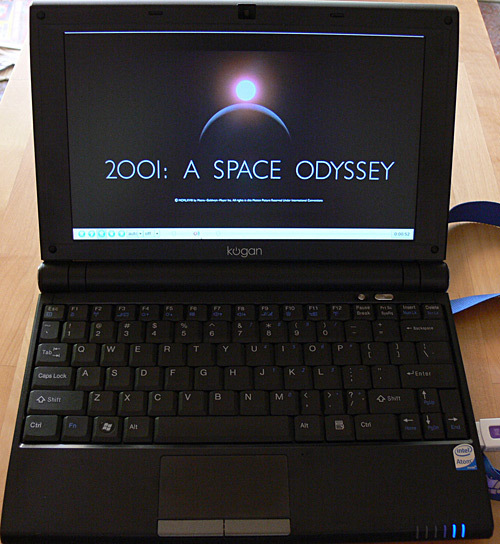 Windows Operating Systems – I installed my own copy of Windows XP SP3 onto the Kogan Netbook Pro using these instructions to see how it worked. Windows XP is clearly faster than gOS on this laptop taking 35 seconds to login screen, total time to desktop 55 seconds. Also Windows offered better wireless access and power saving features as well as a familiar interface that was quick and easy to setup with all my favourite applications. Reports by other people (see blog post comments) are that test versions of Windows 7 also work smoothly on Kogan netbooks. 10″ inch LCD – screen resolution of 1024×600 seems small compared to my desktop computer’s huge 1680×1050 LCD screen but it’s sharp and the Matt finish allows use outside in a shaded area without the excessive glare of reflective LCD screens. Intel Atom N270 1.60GHz CPU – was able to handle everything I made it do in my initial half hour test including web surfing, playing MP3’s, watching full screen DIVX and ripped DVD VOB Files smoothly without dropping any frames and didn’t lose audio/video synch. Size & Weight & Heat: Slightly smaller in width and length compared to an A4 page of paper and as thick as a medium sized paperback book. Weighs 1.4kg including 6 cell battery so it should be easy to carry in a notebook satchel. The base can get pretty warm when being used heavily but is roughly body temperature during light use. 6 cell Battery: has stated capacity of 4400mah and upto 6 hours. I did not have time to test if this was accurate. Reports from other people indicate 4 hours of usage can be expected. 160GB Hard disk – is pretty quiet though obviously not silent like an SSD drive but on the other hand has a lot more capacity to store multimedia (music, videos, images etc) and seems to be quite speedy. 802.11 b/g WiFi – was a little tricky to setup in gOS because my office WiFi system is really secure & locked down. Ran the command : ifconfig -a to get the MAC address of eth1 (wireless). Added this MAC address to my routers wireless MAC address filter. In general the WiFi sensitivity was OK but not as good as other laptops I’ve tested before when trying to use internet access with a weak WiFi signal. EDIT: Kogan tell me they have recognized this issue and their current stock of Netbooks uses a better Ralink wifi card (180MB driver ZIP file) and not the previous VIA wifi card. EDIT2: Kogan posted me the Ralink RT2571WF wifi card they’re using in currently sold Kogan Netbooks. It’s sooooo much better than the VIA VT6656 card they used before. With the Ralink card installed I managed to hold a strong network signal 10metres further away from my WiFi access point than the VIA card could handle. The default Firefox theme takes up way too much of the precious 1024×600 screen space so I replaced it with the Classic Compact Firefox theme which frees up a large amount of screen space to actual view websites with. gOS doesn’t come with any bundled Twitter applications so I downloaded and installed Adobe Air for Linux binary and the latest release of Twhirl. Tweetdeck is another Adobe Air application you could use. After testing it for few days I’ve given it the coveted & rarely given “Neerav’s Going To Buy It Award” because I was looking to buy a netbook laptop computer & it’s the best candidate in terms of Price Vs Performance+Specifications. What software does the gOS supplied come with – what can / cant you do ? Have you tried calling the Kogan support to ask about Windows? Just curious how up to speed they are already. Not sure will rely on the reports of people who’ve bought it to see if tech support is ready. What’s the heat like underneath after an hour or two? What’s it like on the wrist-rest? Was the gOS installed and ready to rock when you opened it – or is there a installation process? There are 2 blue lights at the front of the wrist rest on the right – what are they for? Battery life? Hei! This netbook looks like IMB lenovo thikpad s10 ! does this kogan is ibm created or what? Nice review, I recently bought the Samsung NC10. How does it compare to the Samsung? The kogan online support chat always seems to be offline and there’s not support number to call. You were after some feedback so I thought that I would give you some from a fairly frustrating day. I would expect that I am like many other typical users who are used to the Windows world and have heard a lot about Windows 7 being good to use with netbooks. So I set about trying to install Windows 7. Everything I saw and read let me to believe that installing windows 7 would be a breeze. Sadly, it has not been. The friendly support that was supposed to be forthcoming a short email from someone at the Kogan support centre telling me that they couldn’t give me instructions because it would be “contrary to Microsoft’s policies”. Instead, they gave me a link to someone else’s website with instructions that did not work. After many attempts to get the windows installer to boot from the USB, it finally worked. That took me nearly 2.5 hours this evening to get to that point. My joy at seeing the windows installation screen was short lived when if out that it could only install on a NTFS partition and all of the partitions are only ext3, extended or linux-swap. So I would have to find a way to partition the drive and make it a NTFS drive. Meanwhile, all of the icons in the gParted application are greyed out. I then google around more and find out that they are greyed out because the drives are currently mounted so I have to try to boot in gParted so that I can do the partitioning before the drives are mounted. I have decided not to bother with the dual boot and am using windows 7 exclusively and it’s great! I haven’t had any driver issues (though i’m still playing with it so please consider my comments as still coming from the “discovery” phase). Windows 7 is pretty nice, esp since I’ve come from the XP world. Nice review, can you check device manager and see what brand the trackpad is (eg synaptics, sentelics/other)? Also what is the Wifi adapter (Broadcom/Atheros/Ralink) and model number if possible? Windows wireless drivers for Ralink wifi card (180MB driver ZIP file). Which version 7 anon.keen to do same. – Touchpad is sensitive. When I hit space bar the touchpad respond (e.g. move the cursor) quite often. I’m ok with it since I always bring a mouse. Also, has anyone tried Ubuntu Netbook Remix? 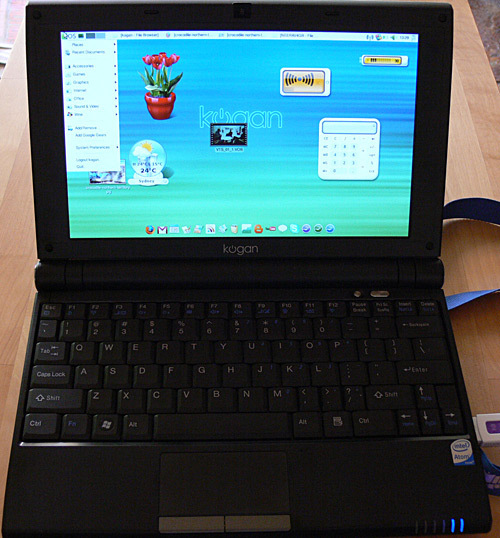 If anyone has installed on Kogan netbook, let us know the performance compare to gOS. Top job on the NIC driver have downloaded and installed. I got my pro version on Tuesday and am relativelty happy with it. Nice screen and very little keyboard flex and I agree with Rosie that the ,./ keys are very close and small. Understand with a low price and linux it will mostly be bought by geeks however would have appreciated some sort of restore media – a 4 gig usb memory stick wouldn’t cost much. The bluetooth dongle unfortunately doesn’t sit flush with the the case when inserted. Does anyone know if there is any beta graphics card drivers for windows7? The vista ones won’t install for me. I managed to get osx installed on it this morning after partitioning the drive have even found an osx driver for the wireless card – will see if it works tonight. @PJ – Very interested to know how OSX runs and what hardware is not currently working, also which version of OSX have you installed? How do I install the bios updates? Wifi is by default ‘on’ when the computer is switched on. Anyone know how to make it ‘off’ by default? Using WinXP. I have been following your adventures with the kogan agora, and brought one myself after your review confirmed my suspicions that it was a decent netbook! I have installed ubuntu netbook remix (UNR) on my agora pro, and after spending a lot of effort and time getting the wireless and touchpad working (especially the touchpad!) I posted the experience at http://agoranetbook.kayno.net/. (Also posted on WP) How do you switch off the touchpad in WinXP – can get in the way while typing? FN ESC does not work? I have solved the problems with the touchpad being too sensitive! gsynaptics provides a means to lower the sensitivity, and syndaemon allows you to disable the touchpad whilst typing. Wireless receptivity is really poor compared to my Macbook. Do you know if there is any way this may be improved. Would a change from Gos to Windows make any difference? How do people find typing on the keyboard? If I have to spend twice as much time editing all my notes, to fix up the miss typed end of sentences, it will not be worth it. Can’t wait to see if these make thier way over to the UK! I just installed Windows 7 Ultimate on my Kogan Netbook Pro. I have just purchased a Kogan Agora Pro and am happy with it, including accessing wireless hotspots, but have one major issue, that you/others can help me resolve. Saving files created in Open Office. Get an error message always (say if attempt to save to desktop) stating the following: ‘folder contents could not be displayed’ ‘error stating file’home/ubuntu/ Documents’: No such file or directory. Hence no luck yet in saving anything new. But it seems fine with files brought to it via a USB drive and worked on using OO if saved on that drive or on say the desktop. Do I need to set up gOS/OO in a particular way – nothing specific was stated in the support doc.